Senator Ex is a reliable very high sensitivity smoke detector for use in Hazarduous areas. The detector is supplied in either a cast aluminium or stainless steel enclosure. Approvals: ATEX rated EEx d IIB +H2 T3, equipment group 2 (Zones 1, 2 and 3), group gases A and B + Hydrogen. An external particle filter is provided allowing ease of maintenance without declassifying the area. Upgradeable Fire and Fault relay outputs are available for interfacing to other fire alarm equipment. Indications LED indications "OK", "Fault" and "Fire"
Command module as per part no. 30624. Constructed in a compact stainless steel enclosure enabling mounting in a 3U high 19" rack mount cabinet. 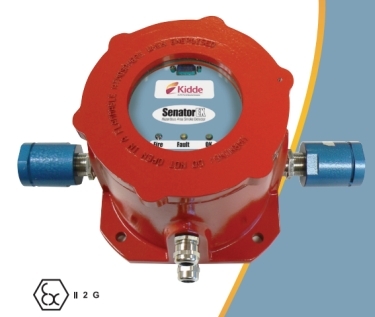 The RDU connects to the Senator range of detectors using the RS485 data bus and mimics the LED status indications of the detector. The RDU monitors the status of a single detector. More than one RDU can be allocated to a single detector. The RDU can be mounted in either a single wall mounted enclosure or a 3U high 19" rack enclosure. Requires a 24vdc supply. This is an optional relay board which can be used with the Senator RDU to provide Volt Free Changeover Contacts for signalling to other equipment. Five relays are provided for Fire 1, Fire 2, Pre-alarm, Aux Alarm and Fault (energised). Can be fitted internally to any Senator detector unit or Command Module allowing them to be connected to an Apollo protocol addressable loop. A single APIC may be used in Multi Address mode when installed inside a command module for signalling up to 127 detectors onto the addressable loop reducing costs on larger systems. Optional card for installation in the Senator Nano Aspirating Detector. The communications card allows the Senator Nano to be connected to a PC or SenseNET network. The Relay/Input card can be fitted into the Senator 25 and 100 detectors to provide an additional five relay outputs for signalling to other equipment. Three inputs are provided on the card that can be programmed for remote reset, isolate, classifire override or PSU fault monitoring.